Europe was once ridden with independent mini-countries but now only a few remain: the mini-states of Andorra, Luxemburg and Liechtenstein as well as the city-states of Monaco, San Marino and the Vatican City with the latter serving as the Catholic Pope’s residency. During my latest and current roadtrip (I’m writing this from Portugal) we passed through first Liechtenstein and then Monaco. Both are interesting places! Europe was once ridden with independent mini-countries but now only a few remain: the mini-states of Andorra, Luxemburg and Liechtenstein as well as the city-states of Monaco, San Marino and the Vatican City with the latter being the serving as the Catholic Pope’s residency. Liechtenstein is a country about 25km’s long, making it large, as far as mini-states go. It is situated in the mountainous Alpes between Switzerland and Austria. We arrived here at 1am and looked around. Even in the dark moon-light, you can feel the charm of this city with winding roads and small shops. High above the centre of Vaduz (the capital) is visible a highly picturesque castle. Unfortunately, you are not allowed to go inside the castle (even during the day) as it is a private residence. The prince of Liechtenstein – Liechtenstein is a Monarchy – still lives there. Furthermore, it has excellent winter sport capabilities and has through a long period of time served as a billionaire tax haven. However, in the recent years, the country is no longer blacklisted as a tax-haven but still bolsters the highest GBP per capita in the world (meaning everyone living here is filthy rich!). 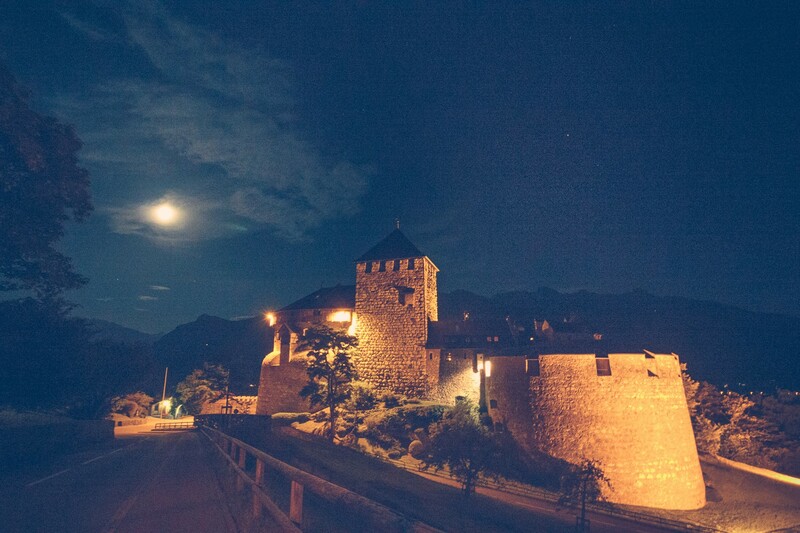 The castle in Vaduz (capital of Liechtenstein) at night. The castle is not small. It stretches far behind what is visible here including several (modern) wings. Of the two, Liechtenstein gives off a secluded private haven in the mountains best suited for people wanting to take a break from an otherwise hectic lifestyle, while Monaco gives off a vibe of all the things your mom says you shouldn’t waste your money on: cars, girls, yachts and casinos. Monaco is a city state located on prime real-estate on the French Riviera overlooking the Mediterranean Sea. It is about 3.5km’s long, meaning that it’s basically just a bay and that you can see from one side to the other from the beach (or from your yacht if you prefer). This makes it the second smallest and densest country in the world. 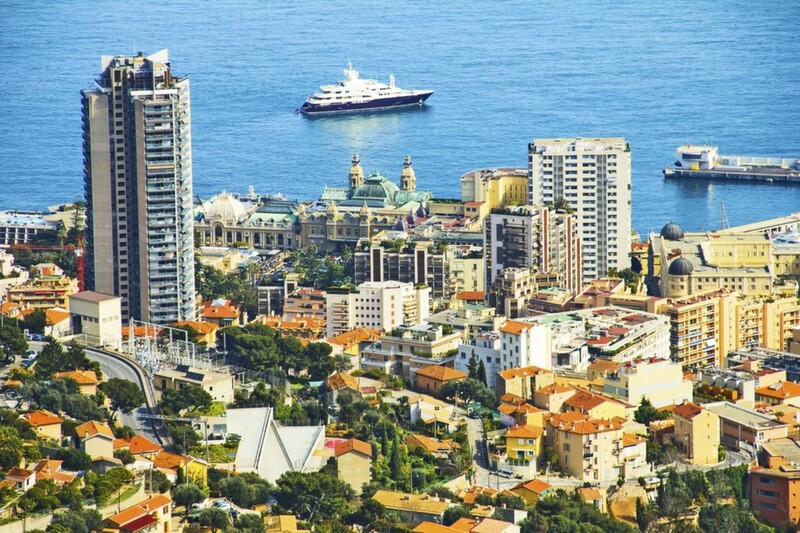 Monaco, like Liechtenstein, is a monarchy with a sovereign Prince as head of state with immense political power. It’s noteworthy that a single house, the house of Grimaldi, has ruled Monaco (with brief interruptions) since 1297! While Liechtenstein has the highest GDP in the world, Monaco comes in at a close second. The reason for this are favourable tax laws, luring wealthy people from all over the world to the country as well as a sprawling gambling industry started with the opening of the famous (or infamous) Monte Carlo casino in 1863. With exuberant social persons, quiet philantropists, casinos and the charming French Riviera combined with agreeable weather this place is currently a very lively place with all of walks of life enjoying their existence here. You’ll see helicopters in the sky and yachts floating outside the coast (all private, of course) topped off with an all you can eat buffet of expensive cars. You’ll see more exotic cars (new and old) within a day here than at any car conventions I’ve been to. If that picture doesn’t convince you, consider this: at any time and at any place – if you look around you’ll see a car worth turning your head for.